Xu Chu can skip his drawing phase to show the top three cards of the deck. He puts the weapons, duels, and basic cards into his hand. If he does this, the damage done by Xu Chu with attacks and duels is increased by one until the beginning of his next turn. 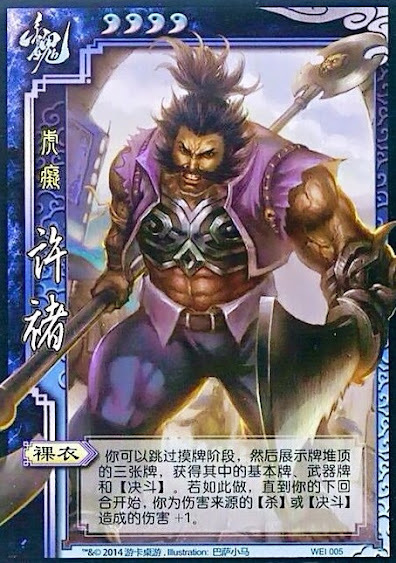 Xu Chu can now cause extra damage outside of his turn after using "Bare the Chest". If he wins a Duel outside of his turn, it would cause extra damage to his opponent as long as he used "Bare the Chest" on his previous turn. This is also true for any Attacks that Xu Chu plays. The extra damage that Xu Chu's "Bare the Chest" affords him stacks with other damage bonuses. For example, if he successfully attacks successfully with Wine after using "Bare the Chest," the attack will cause three units of damage. If Xu Chu is the victim of Starvation, he does not have a drawing phase so he cannot activate "Bare the Chest". Xu Chu's "Bare the Chest" does not modify the requirements of other characters in responding to Xu Chu's Attacks and Duels. Xu Chu's "Bare the Chest" does not increase the amount of damage he receives during his turn if he loses in a Duel. Xu Chu would receive one unit of damage if he loses, whereas his opponent would receive two units of damage if they lose.